The death toll among Afghanistan’s security forces will no longer be sustainable unless urgent measures are taken to address recruiting and training issues, a top US general said Tuesday. Since the start of 2015, when Afghan police and army units succeeded NATO as bearing responsibility for Afghanistan’s security, tens of thousands of local forces have been killed, mainly in Taliban attacks. Lieutenant General Kenneth McKenzie, who has been nominated to lead the US military’s Central Command that oversees wars in the Middle East and Afghanistan, said the death rate may not be sustainable. McKenzie said he would work urgently with General Austin Miller, the head of the NATO mission and US Forces Afghanistan, to tackle problems of recruitment, training and how the Afghans “present forces for actual execution” of missions. “They are fighting hard, but their losses are not going to be sustainable unless we correct this problem,” McKenzie told the Senate Armed Services Committee at his nomination hearing. Afghan President Ashraf Ghani last month said 28,529 Afghan security forces had been killed since the start of 2015, a figure far higher than anything previously acknowledged. McKenzie added that Afghan forces are still unable to effectively withstand the Taliban, who have made steady gains in recent years and who now number about 60,000 in Afghanistan. The Afghan forces are “not there yet, and if we left precipitously right now I do not believe they would be able to successfully defend their country,” McKenzie said. The general would take the helm of Centcom at a difficult time in Afghanistan, where 17 years since the US-led invasion violence is showing no signs of abating. 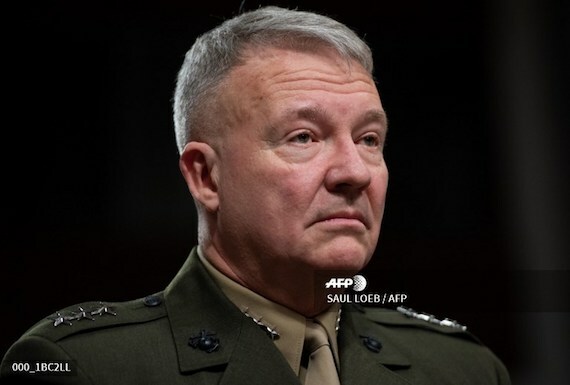 US lawmakers and President Donald Trump are growing increasingly frustrated with a succession of generals promising things may soon turn a corner and angered over the $45 billion or so America still pays annually for its involvement in Afghanistan. McKenzie couldn’t say how much longer the US will be in Afghanistan. Echoing comments made last month by General Joe Dunford, chairman of the Joint Chiefs of Staff, McKenzie said he believed the situation in Afghanistan remains a stalemate. “The operational military situation is largely stalemated,” he said, noting however that he holds out hopes for political efforts for a settlement. If confirmed, McKenzie would gain a fourth star and replace General Joseph Votel, who is retiring.